In the new age of AR, they way we connect with consumers is changing. We’re looking through our screens instead of looking at our screens. Physical interactions and custom experiences are great ways to implement storytelling and immerse people in new surroundings. During the Facebook F8 summit, Mark Zuckerberg presented a lot of exciting AR news for creatives and developers to go play with. Before diving into the F8 update, I want to talk about the journey we at We Are Blossom had up until the update. As of September 2017, we could develop AR filters for use in Facebook camera. At the time AR studio for Facebook was in a closed beta phase, but we were fortunate enough to be included in the process. During this time, we (WeAreBlossom) developed some prototypes for the musical The Lion King, Sportlife and internal marketing purposes to see how this tool would work out. The tool was clearly in an experimental phase. Many of the functions, like normal maps, plane tracking, joint animation, visual coding, were closed and were slowly added to the pipeline. The dedicated AR team of Facebook updates their tool monthly with new exciting features so after a few months the tool was released to the public. It now can be used commercially and is semi-complete with features you expect to have. After this exploring phase we contacted KPN and proposed a Facebook filter to promote their ongoing campaign for the ice skating winter Olympics. The user could experience the sensation of being an ice skater themselves, with official attire and a Dutch flag being hoisted behind them as if they won a medal. Adding physical interactions is key for an experience like this. It’s fun to see how people interact with AR applications like this. They start dancing, start smiling and also an important one; they start exploring. The interactions are triggered by the user so they feel in control on how the experience should look like. What can we expect from Facebook in the couple of months? They did not give specific deadlines when these features will be rolled out but let's see what to expect. Facebook announced that their AR platform will expand to be used on Messenger, Instagram and Facebook-lite. Messenger and Instagram are somewhat different in the way you use it versus Facebook. Instagram on the other hand is also driving on the shareability of a post, but in a different way. Facebook is mostly data driven where information and text is key. While Instagram is image-based and about capturing moments. 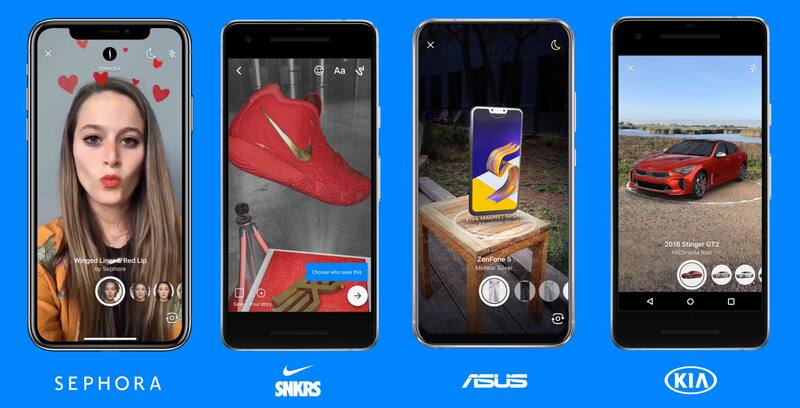 We expect to see a rise in different, more advanced AR content as well as simple small AR content when Messenger and Instagram start implementing the Facebook AR studio tool. Messenger uses information as there key drive to initiate engagement. This means that an AR filter on Messenger should comply to this format. On Facebook it's all about the shareability of a filter while on messenger it's more about giving information, working together with a chatbot and directly selling a product. This means a lot of product visualisations where you can view and buy the product in AR. Messenger is currently in its beta phase with integration of AR filters. Facebook also plans on adding some more advanced systems to their pipeline. With more complex facial tracking, hand-tracking and body tracking for more immersive and complete experiences. The plane tracking isn’t so accurate at the moment, they are planning to implement better ways to get a better experience. Snapchat already uses ARcore and ARkit implementations for significantly better tracking. Analytics is also going to change allot for the AR experiences, as where clients and companies can track what their AR filter is doing and get insights on how to improve their interaction with consumer to make better selling experiences. There are no actual dates as of when this will be featured but this is a key item for companies to drive their engagement. For now, we wait and keep exploring where this journey will take us. I can only imagine the possibilities we will be able to grasp along this and next year. 3D Designer @ WeAreBlossom. Working with traditional 3D implementations and new media like AR and VR.